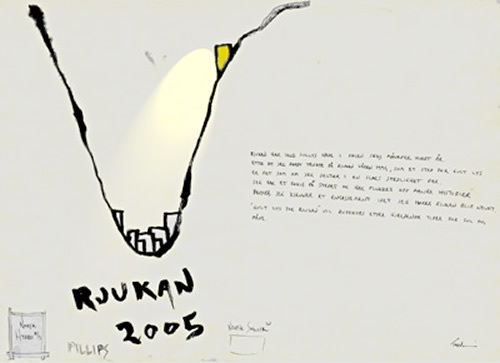 Rjukan is the ultimate site for a grand yellow light project. First of all the city has no sunlight most of the winter, because the tall mountains around it. The yellow light will serve as an energy booster. Secondly, this town is absolutely fascinating because it was designed and built by architects, not unlike Brasilia, only in 1905 when Norsk Hydro wanted to start producing electricity there. Thirdly, Rjukan celebrates 100 years anniversary 2005, both as a city and as the starting point of industrial production in Norway. Actually, I have been writing the town of Rjukan a letter every year since 1994 to ask them to invite me for this purpose. Today it is only three more years to the anniversary. A huge glowing yellow light panel is to be installed high up in the hillside, visible from the whole town.